Re-usable Molding Putty allows you to make molds anytime you want. PRESS for great details. This material makes excellent molds, and it is very easy to use. Recommended for polymer clay, clay, fast cure urethanes, soaps, waxes, and ComposiCast White and Black Resin. To use: Heat ImPRESSive putty until dough/clay like in the microwave. Once the Putty is cool enough to touch, create your mold by pressing an object into the putty. The Putty will become rubber-like after cooling. Create parts with polymer clay, epoxy, polyester, resin, clay, soap, candle, crayon, concrete and more. 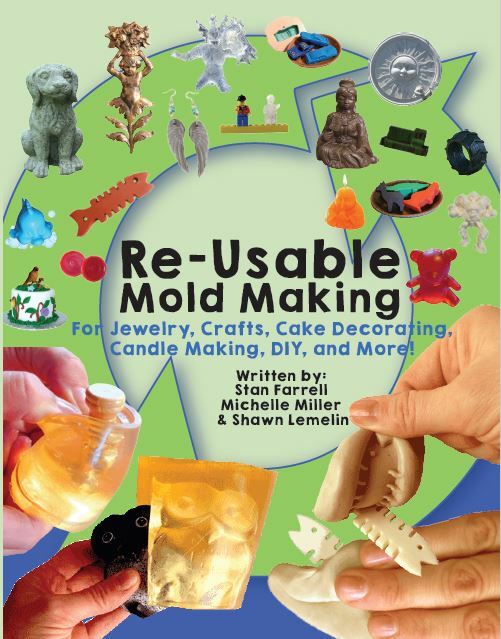 Make molds of sculptures, prototypes, candles, picture frames, coins, and more. As seen on the Polymer Clay Tutor and Blue Bottle Tree. Use it today for fast, easy, mold making. Its great and all but it sometimes melts in my own hand, I think its because of the heat on my hand. Besides that it does what its meant to do. I bought this for a specific project: I am making a polymer clay custom "skin" for a powder compact, and wanted a silicone model of the top of the compact upon which to work and fire. I knew it was going to be a challenge - the compact is super-smooth plastic, making air bubbles a distinct issue, and there is a narrow groove into which the skin fits, also a challenge. The easiest way would have been to pour the first mold in silicone, then pour again into that mold, but that's a lot of wasted silicone, and expensive. It also would have been very exacting to build a clay dam to isolate just the compact top for a silicone pour. I found that any issues I mention below are mostly "user error" - IRP is a very good tool to add to one's kit. Using IRP, I was able to press just the compact top into it, without having to build a dam of any sort. It took 2 tries - I didn't smooth the IRP as well as I should have, so the creases left traces/bubbles in the master pour. I had expected that pressing the compact into the IRP would smooth those out as it would in silicone. I also then smoothed the IRP over the edge of the top, to create a lip so that, when I poured the master, I would be able to fill up the mold and get a smooth bottom. I had a rather thin layer of IRP for the lip, and some of it crumbled off when I removed the compact. When next I use IRP, I will just be sure to have enough thickness for every part of the mold. On my first try, I wiped out the excess activator as directed. However, I poured a resin master during that attempt (cheaper than silicone when experimenting), and it came out extremely bubbled. I believe that is due to activator continuing to leach during the cure. The IRP came with a decided "slimy" feel - I realized that I should NOT have added activator for the first use - it already had plenty. On the second try, I added NO activator, and notice much less activator leaching, and the silicone master came out great. the bag is a great idea - you can knead the IRP after microwaving, then open to pull out as much as you need. However, I wish the kit came in a container with a lid, instead of the hinged plastic pack - there is no way I can get the finished mold (once done with it) back into the package without having to re-microwave all the IRP, so I end up with the various components sitting all over my work bench. It's not a big deal - I will find a different container - but it would be nice to have a branded container in my storage area. I would like to know if there is a IRP-to-IRP release agent I can use that won't corrupt the IRP. IRP would be great for experimenting with 2-part molds before pouring the final one in silicone. I am VERY glad that I finally broke down and bought IRP - it is much easier in certain applications than using ComposiMold, as sometimes one needs a putty, not a pour! It's hot right after I take it out of the microwave, but cools quickly. It is really easy to use. I pressed it over a rubber stamp. Worked really well. Unlike silicone putty, I can re-melt it over and over again. Works really well for fast mold making.